The majority of runners felt extremely comfortable with the cushioning of the Asics Gel Kayano 24. Many of the users were happy with the shoe’s heavy-duty performance and preferred it for long term races and marathons. Users generally appreciated the grip of the outsole and found its support very firm, especially on the heel area. The mid-sole unit’s shock-absorbing ability gained some fans because it apparently prevented any duress generated by the constancy of the foot-strike. The lightweight nature of this product impressed many wearers. The stability mechanisms present in the Kayano 24 gained positive remarks for being reliable. Some customers were attracted to the colors available for this model, as well as its sleek and snappy design. According to a great number of reviews, it remained true to the standard sizing schemes. Some of the buyers were happy with its stretchy fit and the flexible nature of the upper. Some runners reported that the mid-sole unit didn’t make all-day wear very comfortable because it was apparently stiff unwieldy. There were consumers who felt that the price is expensive. A few of the materials used in the upper looked cheap, according to a consumer; he noted that the lettering had dissolved and the colors fused with the laces. Many runners were satisfied with the construction of Asics Gel Kayano 24. For them, it provided an enhanced cushioned ride and high-level support. Most of its users also believed that the tremendous performance of the shoe makes it highly suitable for longer runs. The Kayano model is a premium quality road shoe with revolutionary cushioning and excellent stability, designed in 1993 by Asics Designer-Engineer Toshikazu Kayano. The Kayano team has never lost sight of the original design goal of striving to be the very highest quality stability road shoe available. Asics, formerly Onitsuka Tiger, is today best known for quality sports shoes, was founded in 1949. Today there are more runners at many of the world's major races wearing Asics than any other brand and not very far behind in the number two position is Brooks. The name Asics is an acronym for the Latin phrase "anima sana in capore sano" which in English translates to " a sound mind in sound body", or "anima sana katika corpore sano." in Swahili, for my friends in Tanzania. AHAR (Asics High Abrasion Rubber) is used in the area of the heel for durability while DuraSponge, a blown AHAR variation is used in the remainder of the outer sole for added cushioning and road adhesion. A trussic guidance system (small plastic gridwork under the arch) provides some added stability by resisting torsional twisting forces. The flex grooves and guidance lines are all in the right places and seem to be doing their intended tasks. However, my first impression was that these shoes were going to be far too stiff to enjoy running, I considered returning them even before trying them out, but I went running instead. The Foam-Wars continue between SpEVA, BioMoGo, Boost, Lunarlon, Solyte, FlyteFoam and others, only time will declare to us the winners. Asics is a prime contender with their innovative FlyteFoam. The Kayano is not 100 percent FlyteFoam, there is a generous amount of their famous silicone-based Gel in the forefoot and heel. Often a shoe will only reveal itself once you begin your run and not while standing in the shoe store and this is very much the case with the Kayano 24. The Kayano uses multiple technologies to provide cushioning and stability with a well thought-out combination of foam and gel. FlyteFoam was developed in the labs of the Asics Sports Science Institute over a three year period of research and development. After about 300 prototypes they came up with the right formula for what they now call FlyteFoam. Engineered mesh is used throughout the Kayano's uppers, designed to flex in the right areas while providing shape, comfort, breathability and some stability. The forefoot uppers gently conform to the shape of your feet. Last year's Kayano didn't have a large enough toe box, but the 24 has a wide and tall toe box area. There are no stiff overlays or stitching to rub your feet or inhibit your movement anywhere on this shoe. Asics has removed the Tiger Stripes from the medial side of each shoe. The excellent reflectors that I enjoyed on my Kayano 21 model have miraculously disappeared. Asics should bring back the stripes and make them reflective, and not raise the price. My right heel has always had a little more slip than my left, the Kayano 24 has a new heel clutch, a plastic exoskeletal structure that at first looked excessive, but wraps the heel for a more secure fit, it really works. There are discrete shoelace eyelets, said to enhance fit and comfort. The tongue is very well padded and the point where the front of the tongue attaches to the upper is done with precision so there are no annoying materials or stitches rubbing the top of your foot. There is a luxurious two layer memory foam lining in the heel collar for a personalized fit, just for you. Asics customer service responded to my inquiry concerning gender specifics of the Kayano, responding that size, color and the use of a narrower last were the only changes. But further investigation revealed that there is actually an additional injected layer of the softer Solyte foam for the women's model in addition to an increase from 10 to 13 mm toe drop. Thanks to runningwarehouse.com for that information. Some shoe companies simply change colors and sizes for the women's version, Asics takes the matter of Gender Specific Engineering more seriously. Here is a link to the excellent magazine "Canadian Running" with an informative video about gender specific considerations at Asics. The Asics Kayano was the most pleasant surprise of the year for me! My first run in these shoes was on a foggy and warm pre-dawn summer morning, following an all night rain, traction on the road was very good but only fair on the painted lines. Five miles of easy running in the hills before sunrise on that first run left me full of confidence. Five miles of easy running in the hills before sunrise left me full of confidence. For some reason the Kayano seems to be a fairly good road-hill shoe. I was pleasantly surprised at how the Kayanos allowed me to flatten some of these Indiana and Kentucky hills. The meta heel clutch is attached to the outside of the heel, on the back of the shoe and I am convinced it works. I was pleased and amazed at how light and alive these shoes felt, considering my digital Ohaus made in Switzerland scale reading of 13 oz. 368 grams. The ideal run for this model is a steady pace long distance, what we called in my bicycle days as LSD, long slow distance. Each run is different for many reasons, and I have had more good days than bad with the Kayanos than with any other shoes since the Nike Pegasus 15, from the last century. The FlyteFoam either take less out of your effort or puts more back in. However, these shoes are noisy, in part due to the Asics rubber composition but mostly because of the stiffness. As long as I own these shoes I am going to have to listen to them, a long time perhaps as the outer soles are wearing very well. 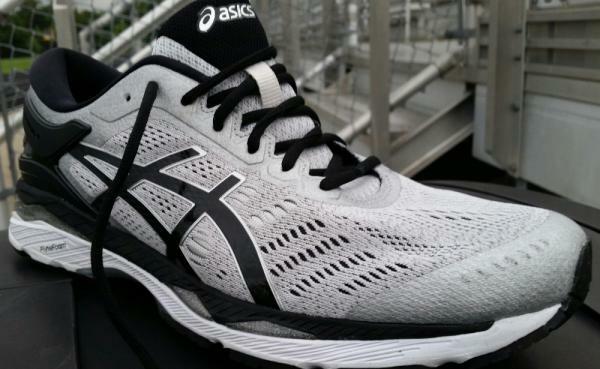 A lighter runner may want to consider a more flexible shoe such as the Asics GT 2000, one model below the Kayano with a lower price but no FlyteFoam. Toe box size increased in volume. Meta clutch heel counter added. Sizes Avail. 6 - 15 U.S. Weight 13.0 oz. / 368gr. One last thought, "I wonder how much of the joy of running in the Asics Kayano 24, is actually simply the joy of the run itself?" The Kayano 24 is the Subaru Outback of shoes. Not the perfect shoe for any situation, but the perfect shoe for any situation. OK, maybe not trail running since it is a road shoe, but the 24th edition of Asics’ premium support shoe is well-balanced, even if it is a tad over-engineered. I had tried these shoes earlier this spring when shopping for a new pair of shoes from Zappos. 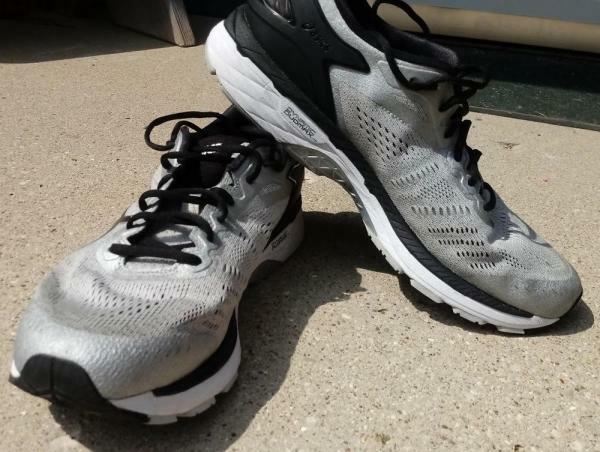 At that time I chose the Brooks Adrenaline 18, citing the $40 cost difference and a nice update of the GTS 18. A few months later when trying on more shoes I purchased the Kayano 24 after they had a price drop. I wanted a daily trainer that can make it to 300 miles and this shoe looked the part. I needed a wide version in Asics and always go for the 4E if available. Asics has been pretty good about offering true 4E widths in their support shoes like the GT-2000s and the Kayanos. The only drawback is the limited color options. The Silver/Black/Mid Grey theme does have a nice refined look to it. The black accents are handsome and the fabric of the upper has smartly-placed reflective accents nestled throughout and looks pleasing in person. While silver can sometimes make a shoe look dated, the silver here is mostly a matte finish (that is still reflective somehow) with some tiny shinier trim accents bordering the Asics lines. It’s as if the designer was trying to be edgy in a sneaky way without compromising the Dad look. The medial side has a very anonymous look to it; noticeably missing the familiar four lines. The light gray rubber on the outsole is a nice touch too, (I am a sucker for light colors on the outsole). The exterior heel counter has a sleek matte black look to it. The tiny details in the counter and the Guidance Trusstic System™ are subtle works of art. Again I commend the designer, going the extra mile to add little details like that are appreciated. As the Kayano series has a reputation for using high-quality materials for a premium feel, I couldn’t wait to put these on. The plush collar feels a lot different and feels much better than previous versions because of the rounded-out shape of it - I think the intention was to prevent going too high and irritating the Achilles. The upper has a mostly seamless feel and stretches nicely to accommodate the foot for all foot shapes/sizes. If you have a high instep or wide foot, this shoe will still fit nicely, as there is plenty of volume if you need it from the midfoot to the forefoot. The only thing I didn’t find comfortable is the insole. After being spoiled by the Brooks GTS 18 insole, the Kayano 24 insole feels a bit disposable. I’m 120 miles into these shoes and I feel like the insole is still not molding to my foot. It also feels too hard and is in contrast with the rest of the shoe’s premium feel. I’ve been using nicely cushioned socks to alleviate these issues with no complaints. Some have noted how stiff the forefoot is on the Asics Gel Kayano 24. It’s definitely one of the less flexible shoes I’ve run in, but I don’t consider it a bad thing. As one who is predisposed to metatarsalgia due to flat arches, I appreciate the conservative management of the shoe. It feels like the shoe is gently preventing you from over-extending in any direction as your foot flexes during the transition. The shoe has nice manners and is perfect for a midfoot-striker. Not sure how it works for heel-strikers but judging by the HUGE heel platform, I assume it was designed for all types of running styles. There is a bit of break-in time (50 miles-ish), but then the shoe really dials in on long runs. The cushioning and support combine to keep your feet and legs feeling good. The shoe is a tad heavy and if you are rotating this shoe with a more minimal shoe, it will feel noticeably heavier. However, the weight is evenly balanced and after a few miles, I completely forgot about it. It really shines as an all-around shoe for high mileage training and can definitely be used in anything from a 5k to a marathon. My favorite feature in the shoe is the support at the back of the heelcap. I really like that stable grip and also that little bit extra depth to the toe box. I really like the running shoes obviously, I don't like the price tag. Unlike the previous versions, the Kayano 24 uses an engineered FluidFit mesh upper. It is made of seamless and soft woven fabric which ensures the circulation of air inside the shoe. This keeps the runner’s foot safe, cool and dry during the run. The shoe uses the fused urethane material and works with external plastic heel counter to promote the natural gait of the runner. The Kayano 24 utilizes FlyteFoam in its midsole. It delivers protection by reducing weight impact on the runner's foot and gives a secure feel. Rearfoot and Forefoot GEL® Technology is also present in the midsole to provide better protection against impact. The Dynamic DuoMax™ Support System ensures stability. It works with the I.G.S.® (IMPACT GUIDANCE SYSTEM) and Guidance Trusstic System™ which supports heel-to-toe transition by supporting the forefoot and the hind foot. The outsole of this Asics shoe is comprised of two proprietary rubber compounds that work together in order to deliver traction and responsible protection against wear and tear. Also, the Rear Foot Crash Pad makes it easier for the foot to land evenly on the ground and transition well towards the toe-off. Asics Gel Kayano 24 fits most runners’ feet and provides true-to-size measurements. The available widths for the men and women’s versions is medium. It accommodates the runners who have medium sized feet. The rear outsole of the Asics Gel Kayano 24 is made of the AHAR® or Asics High-Abrasion Rubber, which delivers reliable traction over the surface. It also uses the DuraSponge®, which reduces supination to give a balanced and stretchy ride to the runners. This lessens the pressure under feet and provides a stable ride. Both the AHAR and DuraSponge material is also present in the Kayano 25 running shoe. The Rear Foot Crash Pad delivers a smooth heel-to-toe transition for a more agreeable running experience. The Asics Gel Kayano 24 has been provided with FlyteFoam® midsole. This material makes use of organic fibers, which make the unit more robust. It also gives a responsive and springy ride. FluidRide® which is not only durable, but also significantly lighter than EVA (ethylene vinyl acetate). The lightweight nature of this unit won’t result in an encumbered feeling. The I.G.S.® (Impact Guidance System) design guides the foot in order to let it achieve a more natural transition through the gait cycle. Another interesting mechanism Guidance Trusstic System™ is used and it works together with the I.G.S.® to structurally support the runner’s foot. It reduces the impact of foot-strikes and supports the weight of the body. The Guidance Line, a flex groove placed vertically in the midsole to guide the runner to follow the natural gait while running. The Rearfoot and Forefoot GEL® Cushioning System is in charge of absorbing impact shock during the foot-strike, making each step more agreeable. The SpevaFoam™ 45 Lasting makes the platform softer and more accommodating of the wearer’s foot. The DuoMax™ Support System, also found in the Kayano 25, offers a package of stability and durability by providing the runners with enhanced support to the mid-foot. Therefore, the runners are able to enjoy a balanced ride without feeling tired. The Gender Specific Forefoot cushioning avails a layer of Solyte foam to provide additional cushioning. This allows the runner to enjoy a soft and plushy feel, especially during the toe-off. The Kayano 24 is provided with an improved engineered mesh upper. It wraps around the foot securely while also preventing irritation. Its open construction accommodates airflow to keep the foot cool and dry. The FluidFit® technology makes use of a mesh that is capable of stretching in multiple directions. It basically allows the foot to move more naturally without feeling restricted by the upper. The Heel Clutching System™ is an external plastic unit that locks the heel in place and prevents it from wobbling while inside the shoe. Runners won’t have to worry about accidental shoe-removals with this add-on. A two-layer memory foam called the Personal Heel Fit (PHF) has been placed in the collar for a personalized fit. It also cushions the ankles and the top part of the heel. The Reinforced Vamp makes the forefoot of the shoe more resistant to tearing and the effects of constant bending of the foot during the toe-off.